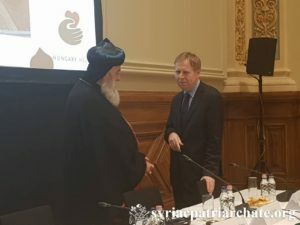 On December 13, 2018, His Holiness Patriarch Mor Ignatius Aphrem II participated in a roundtable discussion on the persecuted Christians, at the Public Service University in Budapest, upon the invitation of Members of the European Parliament as well as Members of the Hungarian Parliament. 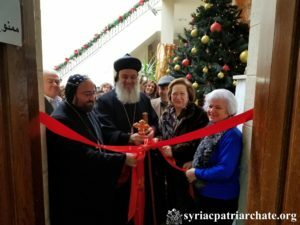 His Holiness was accompanied by His Eminence Mor Timotheos Matta Al-Khoury, Patriarchal Vicar at the Patriarchal Archdiocese of Damascus. His Holiness spoke about the current situation of Christians in the Middle East, especially in Iraq and Syria. He emphasized that the massive exodus of Christians from their homeland has drastic effects on the region and that there is a need to support Christians remain in their homeland. 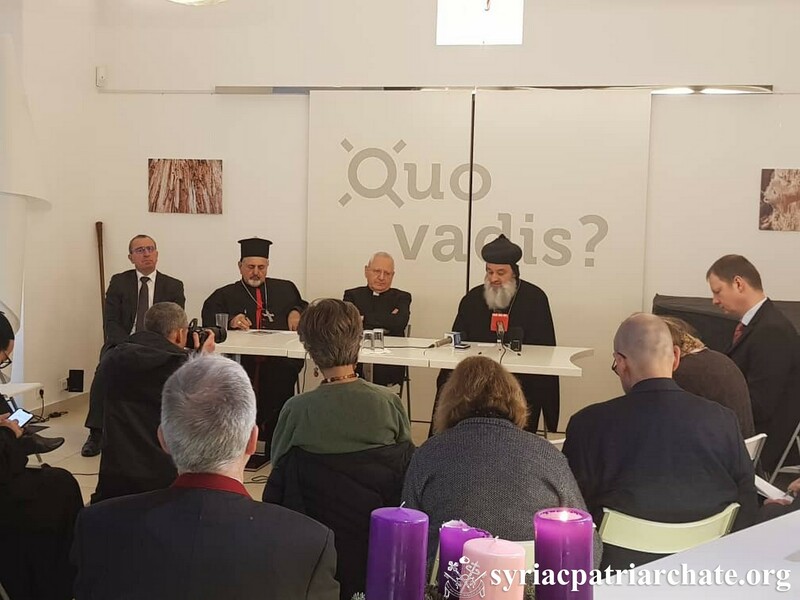 He renewed the appeal to the International Community to help in all ways possible to the return of the abducted Archbishops of Aleppo Boulos Yaziji and Mor Gregorius Youhanna Ibrahim. He also spoke about the different humanitarian projects that the Patriarchate is implementing, mostly through EPDC, to support the suffering people in Syria and Iraq and thanked the Hungarian government for their continuous support for the churches in the Middle East. 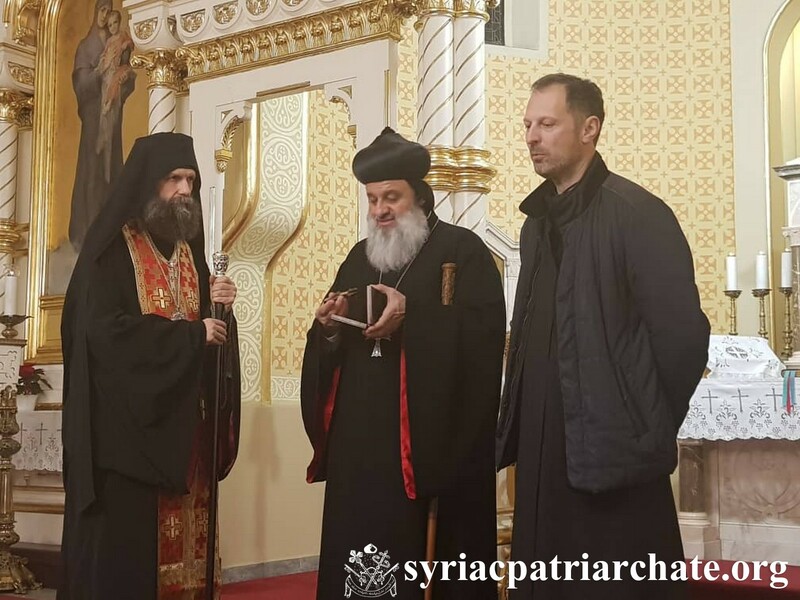 On December 13, 2018, His Holiness Patriarch Mor Ignatius Aphrem II visited the Hungarian Institute of Musicology. 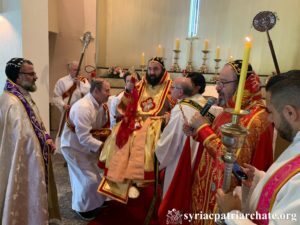 He was accompanied by His Eminence Mor Timotheos Mata Al-Khoury, Patriarchal Vicar in the Patriarchal Archdiocese of Damascus. His Holiness was received at the institute by Prof Pál Richter, Director of the Institute, and Prof Balázs Déri, leader of Eastern Liturgy Research Group. His Holiness was informed about the archiving processes held by the institute for the Syriac music and liturgy. 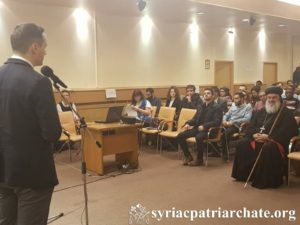 He praised the great efforts made by the institute to preserve the Syriac heritage, and discussed means of collaboration between the institute and Antioch Syrian University, as well as the Syriac Cultural Center being built in Damascus. On December 12, 2018, upon the invitation of the Hungarian Government, His Holiness Patriarch Mor Ignatius Aphrem II met His Excellency Zsolt Semjén, Deputy Prime Minister of Hungary, in Hungary. His Excellency Tristan Azbej, State Secretary for the Aid of Persecuted Christians, also attended the meeting. His Holiness discussed with their Excellencies matters related to the situation in the Middle East, especially in Syria and Iraq. 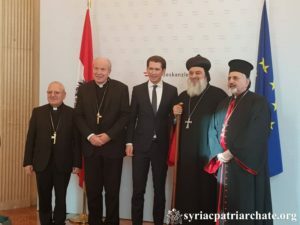 He also thanked the Hungarian Government for the support it provides to the persecuted Christians, and assured that helping Christians remain fixed in their lands and live in dignity is the best way to show support and love. His Holiness was accompanied by His Eminence Mor Timotheos Matta Al-Khoury, Patriarchal Vicar in the Patriarchal Archdiocese of Damascus.Click to view slideshow. 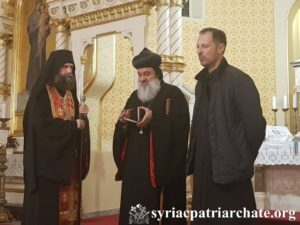 On December 11, 2018, His Holiness Patriarch Mor Ignatius Aphrem II and His Beatitude Mor Ignatius Joseph III Younan, Syriac Catholic Patriarch of Antioch, visited the Holy Cross Monastery near Vienna – Austria. They were received by the Rev. Abbot of the Monastery Fr. Maximilian Haim, and the monks of the monastery. He expressed his joy to receive His Holiness and His Beatitude and have their blessing. 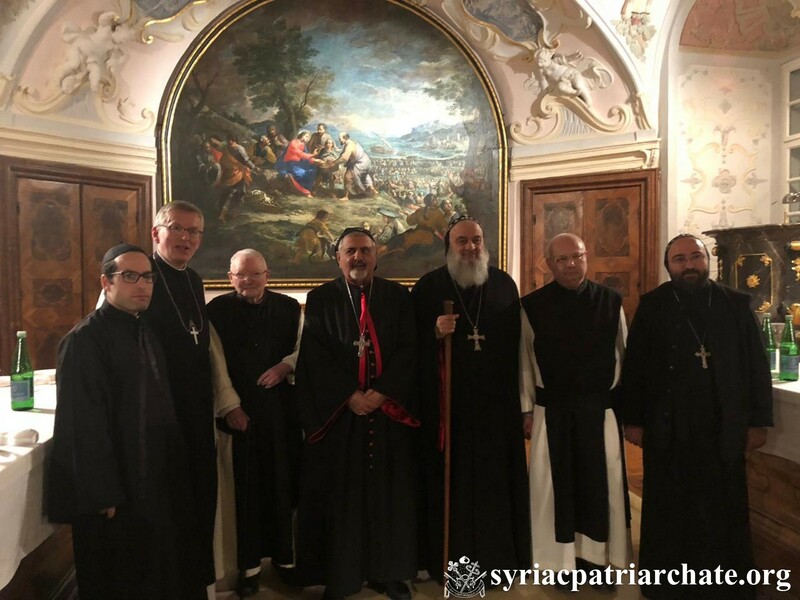 During the meeting, His Holiness and His Beatitude noted the good relations between the Syriac Orthodox Church and the Syriac Catholic Church. They also spoke about the situation in the Middle East, reassuring the importance of protecting the presence of Christianity in the region. Then, His Holiness and His Beatitude presided over evening (Ramsho) prayer in the Church of the monastery. At the end, they gave their blessing to all the monks of the monastery. 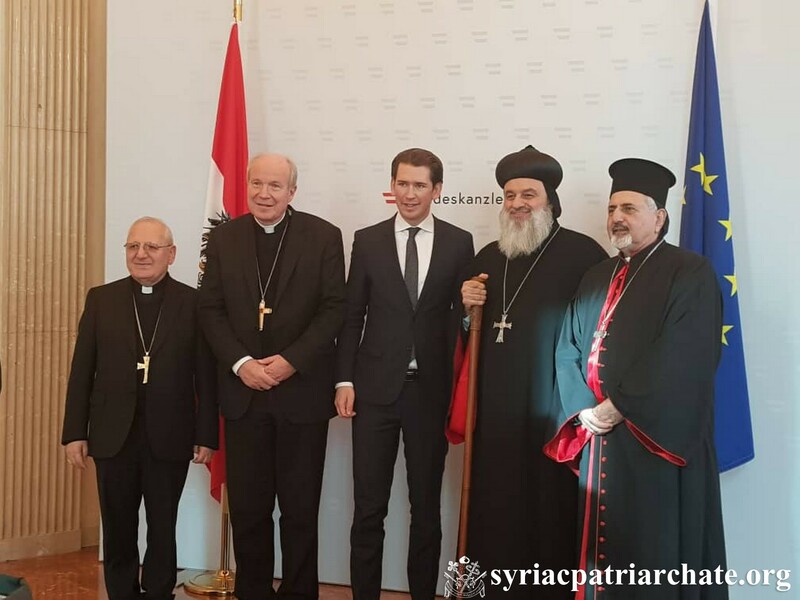 On December 11, 2018, His Holiness Patriarch Mor Ignatius Aphrem II met with His Excellency Austrian Chancellor Mr. Sebastian Kurz, at the chancellery of Austria. Holiness was accompanied by His Eminence Mor Timotheos Matta Al-Khoury, Patriarchal Vicar in the Patriarchal Archdiocese of Damascus.Click to view slideshow. 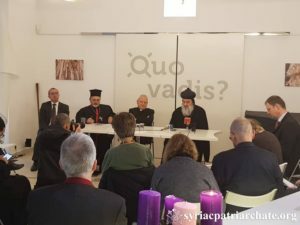 On December 11, 2018, His Holiness Patriarch Mor Ignatius Aphrem II and Their Beatitudes Mor Ignatius Joseph III Younan, Syriac Catholic Patriarch of Antioch, and Cardinal Mar Louis Rafael I Sako, Chaldean Patriarch of Babylon, held a common interview with the media, at the residence of the Archbishopric in Vienna – Austria. They assured the importance of preserving the presence of Christians in the Middle East. His Holiness stressed the significance of having governments that ensure equality between all citizens of one country, regardless of their faith and denomination.